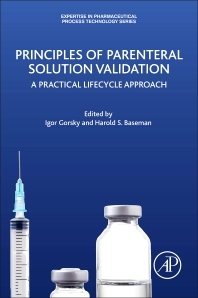 Principles of Parenteral Solution Validation: A Practical Lifecycle Approach covers all aspects involved in the development and process validation of a parenteral product. By using a lifecycle approach, this book discusses the latest technology, compliance developments, and regulatory considerations and trends, from process design, to divesting. As part of the Expertise in Pharmaceutical Process Technology series edited by Michael Levin, this book incorporates numerous case studies and real-world examples that address timely problems and offer solutions to the daily challenges facing practitioners in this area. Igor Gorsky has been a pharmaceutical, biopharmaceutical and medical device industry professional for over 36 years. He held multiple positions with increasing responsibility at Alpharma (Actavis), Wyeth (Pfizer) and Shire (Takeda). He worked in Production, Quality Assurance, Technical Services and Validation including aa a Head of Validation of the Global Pharmaceutical Technology at Shire (Takeda). He is currently holding a position of a Senior Consultant at ValSource, LLC. His over the years accomplishments include validation of all the aspects of pharmaceutical, biotechnology and medical device production and quality management, technical support of multi-billion-dollar drug product lines and introduction of new and innovative products onto the market. He published numerous articles and white papers in pharmaceutical professional magazines and textbooks, namely Pharmaceutical Process Scale-Up Handbook. In addition, he had been a presenter at PDA Annual Meetings, AASP, Interphex, UBM International Workshops and other forums. He taught classes on validation technology in US, India and Israel. He is also very active with PDA participating in several Task force groups authoring PDA Technical Reports 29 (Points to Consider for Cleaning Validation), 60 (Process Validation), 60-2 (Process Validation Annex 1: OSD and SSD Dosage). He is leading PDA Water Interest Group and was named a PDA Volunteer of the Month in Nov/Dec 2014. He also is one of the authors of an ASTM 3106 Standard Guide for Science-Based and Risk-Based Cleaning Process Development and Validation and ASTM G121 Standard Practice for Preparation of Contaminated Test Coupons for the Evaluation of Cleaning Agents He is also a member of ASTM E55, Workgroup 159975 Committee Team drafting a Standard Guide for the Derivation of Health Based Exposure Limits (HBELs). He holds a BS degree in Mechanical/Electrical Engineering Technology from Rochester Institute of Technology. Hal Baseman is chief operating officer and a principal at ValSource LLC and ConcordiaValsource LLC. He has over 40 years of experience in pharmaceutical operations, validation, and regulatory compliance. He has held positions in executive management and technical operations at several drug manufacturing and consulting firms. He has held positions as the Chair of the PDA (Parenteral Drug Association) Board of Directors, the Co-Chair of the PDA Science Advisory Board, the Co-Leader of the PDA Aseptic Processing Points to Consider Task Force and the Co-Leader of the PDA Process Validation Interest Group, as well as a long-time member of the PDA Training Research Institute faculty. He has been a leader, author, editor and contributor to numerous technical reports, articles, books, and presentations on subjects related to Quality Risk Management, Validation, and Aseptic Processing. Hal holds an MBA in Management from LaSalle University and a B.S. in Biology from Ursinus College.